The Massachusetts Music Educators Association runs three sets of 3 day festivals every year – Junior Districts, Senior Districts, and All-State. Students audition for placement into these honors ensembles based on their grade, and where they live. The state is broken down into 5 different districts; for example, students in Wellesley are in the Eastern District, and students in Winchester are in the Northeastern District. Junior Districts are for students in grades 7-9, and Senior Districts are for grades 9-12. If a Senior District student receives a score above a certain threshold, they are eligible to audition for All-State. Senior District Auditions take place in mid-November, with the festival in mid-January. All-State Auditions are held in the third week of January, with the festival in mid-March. Junior District Auditions take place in late January, with the festival in late March. All-State participants can also be considered for All-Eastern and All-National ensembles, run by the National Association for Music Educators. In addition to any audition materials, students must be recommended by their band or orchestra teacher to be considered. NEC Prep has eight large ensembles for students in grade 7 and up: 4 orchestras (Youth Philharmonic Orchestra, Youth Symphony Orchestra, Youth Repertory Orchestra, and Junior Repertory Orchestra), 3 wind ensembles (Senior Massachusetts Youth Wind Ensemble, Massachusetts Youth Wind Ensemble Concert Band, and Junior Massachusetts Youth Wind Ensemble), and a Youth Brass Ensemble. Rehearsals generally take place on Saturday, and are held in the downtown area between Symphony Hall and NEC. Note that auditions for orchestra, wind ensemble, and brass ensemble are scheduled separately. Chamber music is also available either separately, or in addition to large ensembles. BYSO has four large ensembles to choose from for middle and high school students: 3 orchestras (Boston Youth Orchestra, Repertory Orchestra, and Junior Repertory Orchestra), and a preparatory wind/brass group. Rehearsals take place on Sundays at the Boston University West campus College of Fine Arts. Scales from memory. See page 6 of this year’s audition brochure for details. Selected orchestral excerpts. Here are this year’s selections. Chamber music is also available either separately, or in addition to large ensembles. Rivers has two ensembles for high school students: the Rivers Youth Orchestra, and the Rivers Youth Wind Ensemble. Orchestra rehearsals are Fridays from 4-5:30pm, and Wind Ensemble rehearsals are Mondays from 7-9pm, both at The Rivers School in Weston. The Tufts Youth Philharmonic is a relatively new ensemble, open to students aged 13 and up. Rehearsals are Fridays from 4-6:30pm at the Granoff Music Center on Tufts’ Medford/Somerville campus. Powers is home to the Massachusetts Youth Symphony Project, a chamber orchestra for students aged 12-18. Rehearsals are on Saturdays from 3-5pm at the music school in Belmont. WCMS offers an excellent chamber music program for students of all ages. Rehearsal dates and times are arranged according to the schedules of participants and coaches, and are held at the music school. This entry was posted in Teaching and tagged Auditions, Band, Orchestra, Students, Teaching on May 23, 2016 by marinakrickler. Our instruments are extensions of our bodies, so we make music more beautifully when we’re standing tall, and breathing well. 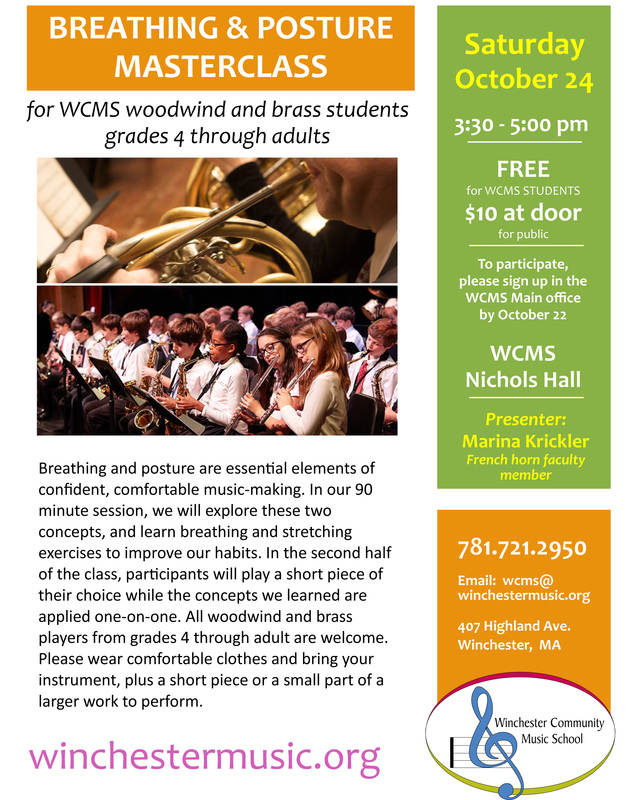 Join me at Winchester Community Music School on Saturday October 24th at 3:30pm for a 90 minute session dedicated to breathing and posture. Free for current WCMS students, admission is just $10 for the general public. Hope to see you there! This entry was posted in Teaching and tagged Teaching, Winchester Community Music School on October 9, 2015 by marinakrickler. Since September 2013, I’ve had the pleasure of being on faculty as a teacher and chamber coach at Winchester Community Music School. 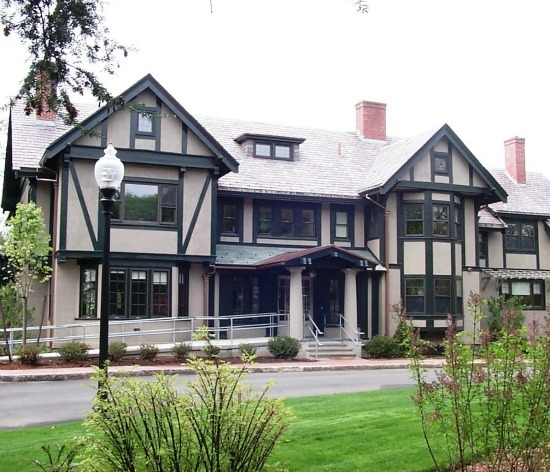 Their facilities are excellent (modern amenities in a beautiful, historic mansion), the staff and faculty are friendly – in short, I’m proud to be a part of it! I’m looking to expand my studio – students of all ages and ability are welcome. For more information, please visit their website, or feel free to contact me directly. This entry was posted in Teaching and tagged Teaching, Winchester Community Music School on November 15, 2013 by marinakrickler.